River rafting in Ladakh is quite unlike anywhere else in the world. It provides the best opportunity to enjoy and experience the natural beauty of the spectacular landscape with deep gorges, towering snow-capped peaks, hilltop monasteries, hillside villages, and glimpses of the unique wildlife. Ladakh offers a range of rafting options on the Indus and its major tributaries. The best stretch for professionally guided runs in white water is on the Indus between Spituk and Nimu or Saspol, which rates 2 to 3 in the international river grading scale of 1 to 6. Participants are required to be trained rafters themselves while the arrangements should be assigned to a dependable professional agency. Adequate arrangements for rescue coverage is an essential pre-requisite for embarking upon a white -water expedition on river like the Zanskar. The area most frequented by foreign climbers is the Nun-Kun massif in the Great Himalayan Range. Its easy accessibility from the Kargil-Padum road and the shortest possible approach march to the base camps makes this massif the most attractive climbing destination in the Great Himalayan. Among its six known peaks accessible from the Suru Valley, Nun (7,135 m) and Kun (7,087 m) are the highest summits. The climbing season extends from mid - May to mid -October, the ideal period being from June to September because during this time only Ladakh remains unaffected by the monsoon which holds sway over most of the Himalaya. Foreign climbing expeditions are required to obtain permission from the Indian Mountaineering Foundation for climbing all listed peaks. A booking fee, based on the height and popularity of the allotted peak, is charged and a Liaison Officer is assigned to every climbing team. The minimum period required for processing applications is six months. Every authorized expedition is provided with adequate rescue coverage in the events of accidents and illness. The trekking options range from short, day-long walks up and down mountain slopes to visit monuments or monastic settlements (or across a ridge to enjoy the sheer beauty of the lunar landscape), or long, trans-mountain treks involving weeks of walking and camping in the wilderness. 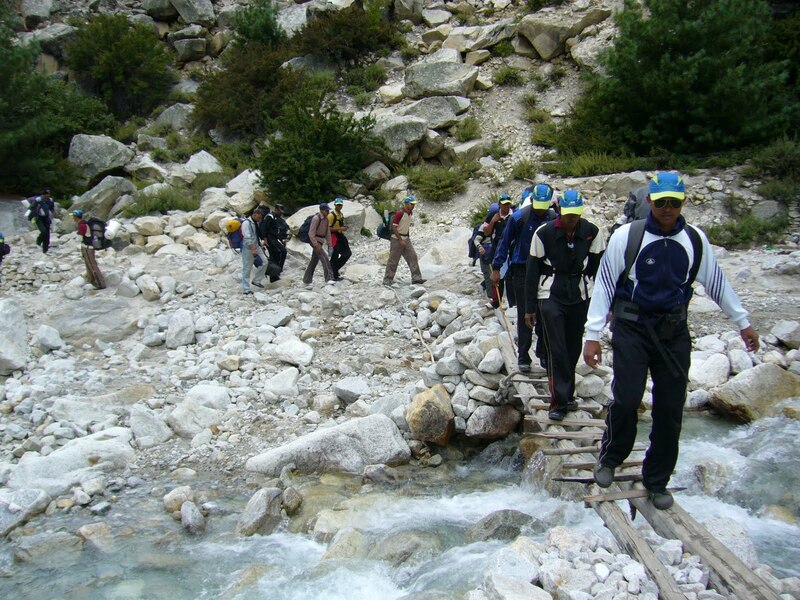 The trek from Lamayuru in the Indus Valley to Darcha in Lahoul, across Zanskar Valley, takes nearly three weeks and crosses 2 major mountain ranges. The easiest way to go on a trek is through a travel operators, who will take care of all necessities including camping gear, provisions, porterage, staff, etc. But if you intend to make you own arrangements, it is recommended to carry as much of your provision and fuel from Leh or Kargil as possible. Ladakh is a harsh land where most villagers cannot part with their foodstock. In some villages along the trek, fresh yoghurt and some tsampa can be procured, but these sources are not reliable. Kerosene or gas for cooking stoves must be carried in sufficient amount to last the duration of the trek as fuel is unlikely to be available along most of the routes.